Before we talk about the advantages of buying a diamond on a blockchain, there is something that needs to be clarified. Not all diamond blockchains offer trading facilities and there are some blockchains that, are designed by technical geniuses with little knowledge about diamond trade and the industry. •	A diamond blockchain promoted by a diamond professional should be more reliable. 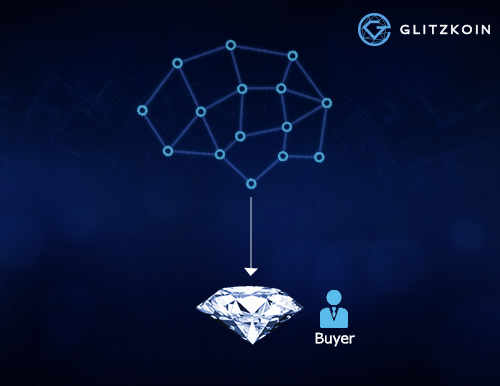 •	Choose a diamond blockchain that supports both, B2B and B2C transactions. •	Blockchains that restrict diamond listings to certified diamonds should be preferred. •	A diamond blockchain that uses its own cryptocurrency to settle payments, should be of interest. Let’s spend a moment looking at conventional diamond trade as it is conducted today. It is well known that a certified diamond would in most cases, make a safer purchase. However very few of the diamonds that are traded each day, are really certified. Diamond trade is symbolized by middlemen, a single diamond can pass through multiple brokers before it reaches the final buyer. This process is responsible for price inflation, it also raises the possibility of diamonds being misrepresented in terms of quality and grade. Cases of fake or synthetic diamonds being sold as the real thing, are not unheard of. We talked about a diamond blockchain that deploys its own cryptocurrency to settle payments, what are the real benefits of this feature. Diamond trade is generally conducted on an international level, much of the buy and sell activity happens in countries that are outside the mining and cutting locations. Payments are processed through banks, this brings in challenges related to lengthy procedures, delays and costs. And the issue of multiple currencies further aggravates the situation. Using a crypto token to settle payments will eliminate the obstacles that the banking system throws up. Processing would be extremely quick and there would be no worries about currency conversions. Here is a quick summary of GLITZKOIN and the DiaEx Diamond Exchange. Promoted by a second generation diamond veteran, this project evolved after a thorough study of the challenges and inefficiencies in the diamond industry. The GTN crypto token would be used to settle payments on the DiaEx diamond exchange. The features of this diamond exchange, fulfill all the requirements that you would expect from a superior diamond blockchain.